Amazon EC2 Update – Virtual Private Clouds for Everyone! If you use or plan to use Amazon EC2, you need to read this post! Way back in the beginning (OK, 2006) we launched Amazon EC2. When you launched an instance we gave it a public IP address and a DNS hostname. You had the ability to create a Security Group for ingress filtering and attach it to the instance at launch time. Each instance could have just one public IP address, which could be an Elastic IP if desired. Later, we added private IP addresses and an internal DNS hostname to each instance. Let’s call this platform “EC2-Classic” (that will be on the quiz, so remember it). In 2009 we introduced the Amazon Virtual Private Cloud, better known as the VPC. The VPC lets you create a virtual network of logically isolated EC2 instances and an optional VPN connection to your own datacenter. In 2011 we announced a big upgrade to EC2’s networking features, with enhanced Security Groups (ingress and egress filtering and the ability to change membership on running instances), direct Internet connectivity, routing tables, and network ACLs to control the flow of traffic between subnets. We also added lots of other features to VPC in the past couple of years including multiple IP addresses, multiple network interfaces, dedicated instances, and statically routed VPN connections. We want every EC2 user to be able to benefit from the advanced networking and other features of Amazon VPC that I outlined above. To enable this, starting soon, instances for new AWS customers (and existing customers launching in new Regions) will be launched into the “EC2-VPC” platform. We are currently in the process of enabling this feature, one Region at a time, starting with the Asia Pacific (Sydney) and South America (So Paulo) Regions. We expect these roll-outs to occur over the next several weeks. We will update this post in the EC2 forum each time we enable a Region. You dont need to create a VPC beforehand – simply launch EC2 instances or provision Elastic Load Balancers, RDS databases, or ElastiCache clusters like you would in EC2-Classic and well create a VPC for you at no extra charge. 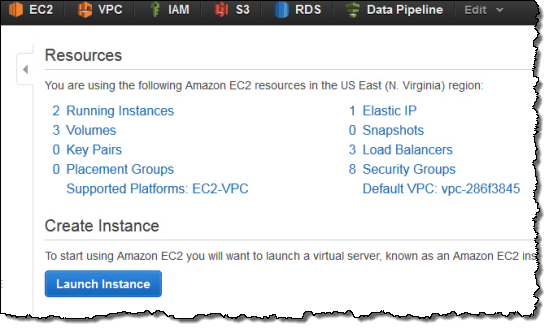 Well launch your resources into that VPC and assign each EC2 instance a public IP address. You can then start taking advantage of the features I mentioned earlier: assigning multiple IP addresses to an instance, changing security group membership on the fly, and adding egress filters to your security groups. These VPC features will be ready for you to use, but you need not do anything new and different until you decide to do so. We refer to the automatically provisioned VPCs as default VPCs. They are designed to be compatible with your existing shell scripts, CloudFormation templates, AWS Elastic Beanstalk applications, and Auto Scaling configurations. You shouldnt need to modify your code because youre launching into a default VPC. The default VPC features are available to new AWS customers and existing customers launching instances in a Region for the first time. If youve previously launched an EC2 instance in a Region or provisioned ELB, RDS, or ElastiCache in a Region, we wont create a default VPC for you in that Region. If you are an existing AWS customer and you want to start gaining experience with this new behavior, you have two options. You can create a new AWS account or you can pick a Region that you haven’t used (as defined above). You can see the set of available platforms in the AWS Management Console (this information is also available through the EC2 APIs and from the command line). Be sure to check the Supported Platforms and Default VPC values for your account to see how your account is configured in a specific Region. You can determine if your account is configured for default VPC within a particular Region by glancing at the top right corner of the EC2 Dashboard in the AWS Management Console. Look for the Supported Platforms item. 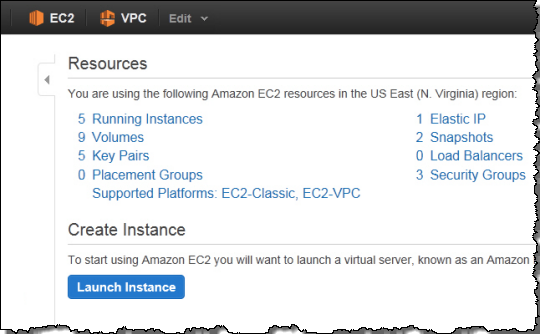 EC2-VPC means your instances will be launched into Amazon VPC. You can also see the supported platforms and the default VPC values using the EC2 API and the Command Line tools. One default subnet per Availability Zone. A default route table, preconfigured to send traffic from the default subnets to the Internet. An Internet Gateway to allow traffic to flow to and from the Internet. Each VPC will have its own private IP range (172.31.0.0/16 to be precise); each subnet will be a “/20” (4096 IP addresses, minus a few that are reserved for the VPC). EC2 instances created in the default VPC will also receive a public IP address (this turns out to be a very sensible default given the preconfigured default route table and Internet Gateway). This is a change from the existing VPC behavior, and is specified by a new PublicIP attribute on each subnet. We made this change so that we can support the EC2-Classic behavior in EC2-VPC. The PublicIP attribute can’t currently be set for existing subnets but we’ll consider allowing this in the future (let us know if you think that you would find this to be of use). You can modify your default VPC as you see fit (e.g., creating or deleting subnets, creating or modifying route tables, adding VPN connections, etc.) You can also create additional, nondefault VPCs just like the VPCs you can create today. Once you are up and running in a VPC within an AWS Region, you’ll have access to all of the AWS services and instance types that are available in that Region (see the List of AWS Offerings by Region page for more information). This includes new and important services such as Amazon Redshift, AWS OpsWorks, and AWS Elastic Beanstalk. DNS Hostnames – All instances launched in a default VPC will have private and public DNS hostnames. DNS hostnames are disabled for existing VPCs, but can be enabled as needed. If youre resolving a public hostname for another instance in the same VPC, it will resolve to the private IP of the target instance. If youre resolving a public hostname for an instance outside of your VPC, it will resolve to the public IP address of that instance. DNS Name Resolution – DNS resolution is enabled in all VPCs but weve added the ability for you to disable use of the Amazon provided DNS service in your VPC as needed. ElastiCache – You can now create ElastiCache cache nodes within VPC (both default and nondefault VPCs). RDS IP Addresses – RDS database instances in VPC can now be provisioned as Internet-facing or private-facing instances. Internet-facing RDS database instances have public IP addresses so that they can be accessed from EC2 Classic instances or on-premises systems. For more information on this feature, read the documentation on Amazon RDS and the Amazon Virtual Private Cloud Service. Differences Between Amazon EC2-Classic and EC2-VPC. Were happy to give you the advanced features of Amazon VPC coupled with the simplicity of Amazon EC2. If you have any questions, the AWS Support Team is ready, willing, and able to help.